Population 1 Is A Type Of Star. Population 1 stars litter the milky way galaxy. Population I stars or metal-rich stars are those young stars whose metallicity is highest. The Earth's Sun is an example of a Population I star. Population I stars are common in the Spiral arms of the Milky Way galaxy. Generally, the youngest stars are found further in, and intermediate population I stars are further out, etc. The Sun is considered an intermediate population I star. Population I stars have regular elliptical orbits of the galactic centre, with a low relative velocity. The high metallicity of Population I stars makes them more likely to possess planetary systems than the other two populations, since planets, particulalry terrestrial planets, formed by accretion of metals. The globular cluster M80. 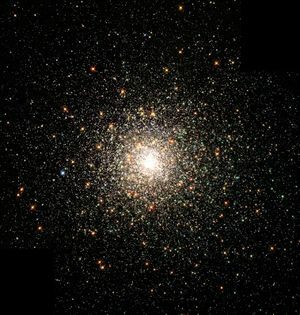 Stars in globular clusters are mainly older metal-poor members of population II stars. In astronomy and Physical cosmology, the metallicity of an object is the proportion of its matter made up of chemical elements other than Hydrogen and helium. Since, on the grandest of scales, the universe is overwhelmingly composed of Hydrogen and helium, astronomers collectively label all heavier elements metals. For example, a nebula rich in carbon compounds would be called "metal-rich", even though carbon is not considered a metal in other contexts. Because the temperatures of stellar bodies break down almost all chemical bonds, and thus allow virtually no normal chemistry to exist, the term "metal" in astronomy technically refers to those materials created by the fusion of helium. The metallicity of an object can give an indication of its age. When the universe first formed (according to the big bang theory), it consisted almost entirely of hydrogen which, through primordial nucleosynthesis, created a sizeable proportion of helium and only trace amounts of lithium. The first stars, referred to as Population III, had virtually no metals at all. These stars were incredibly massive and, during their lives, created the elements up to iron on the periodic table via nucleosynthesis. They subsequently died in spectacular supernovae which dispersed those elements throughout the universe. As of 2005, no Population III stars have been found; rather, their existence is inferred in current models of the origin of the universe. The next generation of stars was born out of those materials left by the death of the first. The oldest observed stars, known as Population II stars, have very low metallicities; as subsequent generations of stars were born, they became more metal-enriched as the gaseous clouds from which they formed recieved the metal-rich dust manufactured by previous generations. As those stars died, they returned metal-enriched material to the interstellar medium (ISM) via Planetary nebulae and supernovae, enriching the nebulae out of which the newer stars formed even further. These youngest stars, including the Sun, therefore have the highest metal content, and are known as Population I stars. The metallicity of the Sun is approximately 1.6 per cent by mass. For other stars, the metallicity is often expressed as [Fe/H], which represents the logarithm of the ratio of a star's iron abundance compared to that of the Sun. Young Population I stars have significantly higher hydrogen-to-iron ratios than older Population II stars. Primordial Population III stars are estimated to have a metallicity of less than -6.0 (that is, less than a millionth of the abundance of iron that is found in the Sun). Across the Milky Way, metallicity is higher in the galactic centre and decreases moving outwards. The gradient in metallicity is attributed to the density of stars in the galactic centre: there are more stars in the centre of the galaxy and, so, over time, more metals have been returned to the ISM and incorporated into new stars. By a similar mechanism, larger galaxies tend to have higher metallicities than smaller ones. In the case of the Magellanic Clouds, two small Irregular galaxies orbiting the Milky Way, the Large Magellanic Cloud has a metallicity about 40 per cent of the Milky Way, while the Small Magellanic Cloud has a metallicity about 10 per cent of the Milky Way. Population II or metal-poor stars are those with relatively little metal. The idea of a "relatively" small amount must be kept in mind because even metal-rich objects contain very small amounts of any element other than hydrogen and helium; metals make up only a small percentage of the chemical make up of the universe, even 13.7 billion years after the Big Bang. However, metal-poor objects are even more primitive. These objects formed during earlier times in the universe. They are common in the bulge near the centre of the galaxy, and in the Galactic halo. globular clusters also contain high numbers of Population II stars..
Scientists have targeted these oldest stars in several different surveys, including the HK objective-prism survey of Timothy C. Beers et al. and the Hamburg-ESO survey of Norbert Christlieb et al., originally started for faint quasars. Thus far, they have uncovered and studied in detail about 10 very metal-poor stars (as CS22892-052, CS31082-001, BD +17º 3248) and two of the oldest stars known to date: HE0107-5240 and HE1327- 2326. Probable glow of Population III Stars from NASA's Spitzer telescope. Credit: NASA / JPL-CALTECH / A. KASHLINSKY (GSFC). Population III or metal-less stars are a hypothetical population of extremely massive stars that are believed to have been formed in the early universe. They have not been observed directly, but are thought to be components of faint blue galaxies. Their existence is necessary to account for the fact that heavy elements, which could not have been created in the Big Bang, are observed in quasar emission spectra as well as the existence of faint blue galaxies. It is believed that these stars triggered a period of reionization. Current theory is divided on whether the first stars were very massive or not. One theory, which seems to be borne out by computer models of star formation, is that with no heavy elements from the Big Bang, it was easy to form stars much more massive than the ones visible today. Typical masses for population III stars would be expected to be about several hundred solar masses, which is much larger than current stars. Analysis of data on low-metallicity Population II stars, which are thought to contain the metals produced by Population III stars, suggests that these metal-free stars had masses of 10 to 100 solar masses instead. This also explains why there have been no low-mass stars with zero metallicity observed. Confirmation of these theories awaits the launch of NASA's James Webb Space Telescope. New spectroscopic surveys, such as SEGUE or SDSS-II, may also locate them. The highest-mass star which may form today is about 110 solar masses. Any attempt to form a star greater than this results in the protostar blowing itself apart during the initial ignition of nuclear reactions. Without enough carbon, oxygen and nitrogen in the core, however, the CNO cycle could not begin and the star would not go nuclear with such enthusiasm. Direct fusion through the Proton-proton chain does not proceed quickly enough to produce the copious amounts of energy such a star would need to support its immense bulk. The end result would be the star collapsing into a black hole without ever actually shining properly. This is why astronomers consider population III to be somewhat of a mystery--by all rights they should not exist, yet they're needed to explain the quasar observations. If these stars were able to form properly, their lifespan would be extremely short, certainly less than one million years. As they can no longer form today, viewing one would require us to look to the very edges of the observable universe. (Since the time it takes light to reach Earth from great distances is extremely long, it is possible to see "back in time" by looking farther away.) Seeing this distance while still being able to resolve a star could prove difficult even for the James Webb Space Telescope.